Section X Class A Championship - St. Lawrence U.
Massena’s Alex Rusaw (15) singles to centerfield for a base hit in the top of the second. 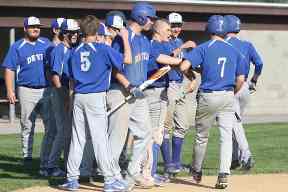 Massena and Malone traded sixth-inning rallies, but the Huskies trumped the Raiders’ rally with a comeback tally in repeating as Section X Class A champions. 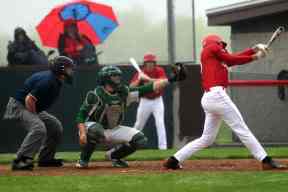 Despite a steady drizzle, Massena opened with a 1-0 lead when Chris Page scored on an infield hit by Robbie Southwick. 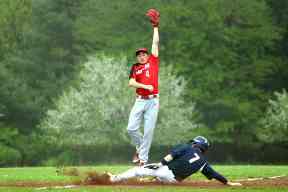 Malone bats started to come alive in the third inning when Brandan Boulia scored on a two-out single by Evan Keegan. 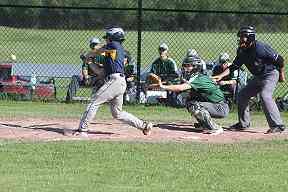 Perry Hungerford drove in two runs in the fourth inning, as Malone opened a 4-1 lead. Massena then rallied for four runs to tie the game 5-5 in the top of the sixth, only to be outdone by the Huskies with two runs in the bottom of the frame. Winning reliever Matt Marlow dealt a scoreless seventh for Malone to hold onto the 7-5 win. Malone advances to New York State playoffs on May 31st, at 5:00 p.m., at Norwood-Norfolk against the Section III champion. Massena finished at 7-7 overall. Malone falls 7-3 to e.s.m. East Syracuse-Minoa’s Dan Garris (21) slides onto the bag, getting under the tag from the Malone third baseman in the top of the fourth inning. 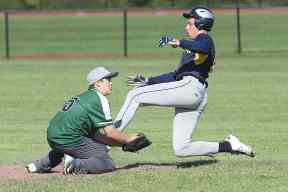 Section X Class B Championship - St. Lawrence U.
Salmon River first baseman Connor Lewis (77) beats the runner to the bag on a fly-out double play to end the sixth inning. Potsdam plated two runs in the first inning when Keller McGowan and Zach Woods scored on Teddy Rice's single. The Sandstoners extended their lead to 3-0 in the second frame when David Lucht doubled, then scored on James Robinson's base hit. Don Johnson scored on a Will Roda single in the third to open a 4-0 lead. 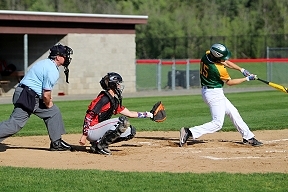 Salmon River's Cameron Cartier scored on a Connor Lewis single in the fourth. Cartier hit a solo homer in the sixth to cut the lead to 4-2. Pitcher Syl Foisy allowed just one hit in the seventh inning to seal Potsdam's win. Salmon River finished its season at 1-13 overall. 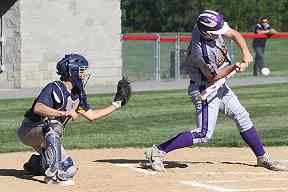 AA Canton batter launches the ball into right field to lead off the bottom of the first inning with a base hit. Salmon River advances to face top-seeded Ogdensburg in the Class B semifinals. Canton finished its season at 3-10 overall. Albany pitcher Ben Seiler (17) took the mound midway through the fourth inning and finished the game throwing 75 pitches. Seiler’s strong pitching held the Blue Devils to just three runs to end the game, even after their hot start with four runs in the first inning alone. 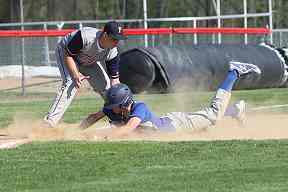 An Ogdensburg base runner slides onto third base just beating out the tag from the Potsdam third baseman to advance into scoring position in the top of the first inning. 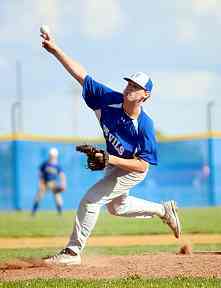 Ogdensburg pitcher Jackson Troiano (23) delivered a strong performance, allowing just one run in the final inning, three hits and nine strikeouts. O.F.A. posted one run in the first, two runs each in the second and third, plus three in the fourth, one in the fifth and two more in the sixth. Troiano and Jared Barr scored three times each. The Wildcats' lone run came in the 6th when Ty Reed scored on a double from Devin June. Gouverneur closed out the season at 5-8 overall. NYSPHSAA Class C Opening Round at SUNY Platts. St. Lawrence Central’s pitcher Ryan Newtown (13) delivers a strike during fourth inning action. 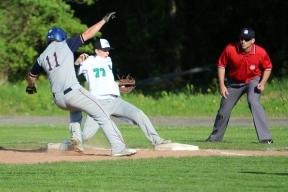 The second-seeded Panthers battled back from a 4-1 deficit to tie the contest with two runs in the fifth inning. 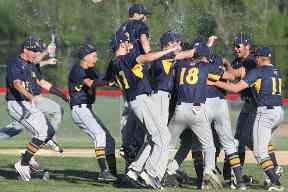 B-M notched the game-winning run in the sixth inning Josh Langdon got aboard on an error, swiped second and third bases, then scored on a wild pitch. Gage Martin was hit by a pitch, stole second and went to third on a fielder’s choice. Martin came home to score on an infield ground out. The Panthers advance to face top-seeded Norwood-Norfolk for the Class C title. The Larries closed out their season at 5-8 overall. Norwood-Norfolk’s Bobby Voss (15) drives the ball into deep centerfield for a double in the bottom of the third inning. In the top of the first, Brushton's Wayne Palmer blooped the ball to left, Panthers score two. In the bottom of the first, Norwood-Norfolk's Pat Smith singled to left, plating Caleb Bresett and cutting the Panthers' lead to 2-1. Carter Wheeler stroked an infield grounder that's mishandled, allowing the Panthers to score a third run. The Flyers scored twice in the bottom of the 7th, but could not score the equalizer in a 7-6 final. NYSPHSAA Class D Opening Round- SUNY Platts. 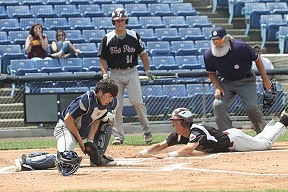 Section X Class D Championship - St. Lawrence U.
Heuvelton’s Bryce Lake (10) drives the ball into the gap in centerfield for a base hit and to load the bases in the top of the first inning. 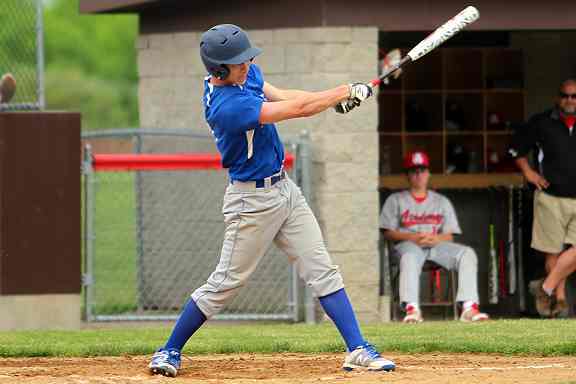 Heuvelton broke onto the scoreboard with a pair of runs on a bases-loaded single from Jonathan Trathen. The Jackets answered in the bottom of the second when Dan Dominy drilled a long triple to rightfield that rolled to the wall, driving in Caleb Lawrence. Nate Moulton then flew to right field, but Trathen's throw to the plate nailed Dominy's attempt to score. 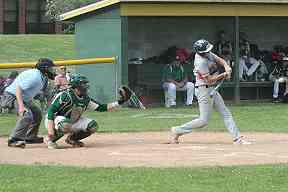 The game remained 2-1 Heuvelton until the bottom of the sixth inning when M-W turned the tide. Brayden Bush led off got hit by a pitch to start the inning. Shane Tiernan and Kyle Field followed with back-to-back singles. Ryan VanPatten and Caleb Lawrence followed with back-to-back doubles to put the Jackets in front 4-2. Dominy's infield sacrifice and Shea Putney's single each added a run to make it 6-2. After a shaky 2nd inning, Tiernan settled down to pitch scoreless ball, allowing just four hits total. 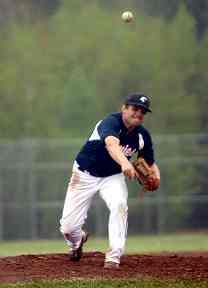 The Bulldogs, they were led by Shane Putman and Keegan Kelly who each scored a run in the second inning. Madrid-Waddington’s Jacob Thomas (4) drives the ball into the gap between right and center fields for a base hit in the bottom of the fourth inning. 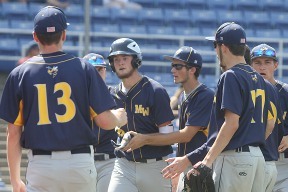 Madrid-Waddington scored a run in the first inning when Brayden Bush scored on a Shane Tiernan sacrifice fly to left. Ryan Van Patten scored on Dan Dominy's RBI single in the second. The Jackets doubled the lead in the third frame with the help of a passed ball and an error to make it 4-0. M-W doubled the score again in the fourth when Bush tripled, Tiernan doubled and Kyle Field singled on successive at bats. 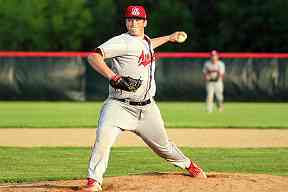 Madrid-Waddington pitcher Evan Ruddy tossed the complete-game shutout, allowing just one hit to the Rockets' Tristin Simmons in the fifth inning. 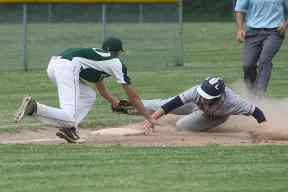 A Fort Plain base runner slides head first into home plate beating out the tag from Madrid-Waddington catcher Owen Uppstrom to score the fifth run for the Hill Toppers in the fifth inning. The Jackets put runners on base in every inning, but were unable to string enough hits together, stranding 11 runners on base over the course of the semifinal. Fort Plain pitchers struck out 14 M-W batters, while allowing just four hits to outlast the Jackets. 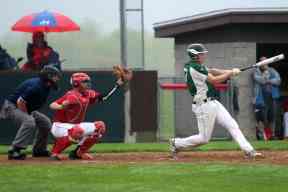 Tiernan had two of the hits, while Kyle Field and Brayden Bush each had a single. Tiernan struck out seven for the Jackets, and worked his way around four fielding errors in the first four innings, while the Jackets fell behind 6-0. 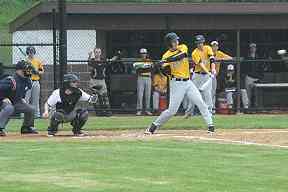 Tiernan's two-run homer kept the Jackets within range at 6-2. Madrid-Waddington finished its season at 14-2. Heuvelton’s Jordan Fisher (2) rounds second and looks to slide into third base after a deep ball hit by Jededia Crayford in the pivotal bottom of the 6th. Crayford's base hit sent two other Bulldogs home, during a pivotal seven-run uprising in what was a seesaw battle. After Heuvelton took a 1-0 lead in the first, Tupper Lake scored four in the second and three in the third to build a 7-1 lead. Heuvelton bounced back with four runs in the fourth, with Dawson Marino leading off with a triple. Adam Calton and Noah Steele then singled, and Bryce Lake hit a sacrifice fly for a run, cutting the lead to 7-6. Tupper tacked on a run in the fifth. The Bulldogs scored two in the bottom of the frame to tie 8-8, but the Jacks reopened the two-run lead in the 6th. 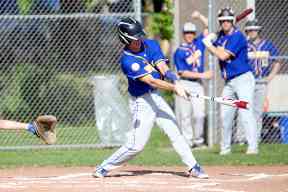 Then came the pivotal 6th, in which the Bulldogs were aided by two errors, a hit batsman, and back-to-back two-run hits for Marino and Dan Pray. 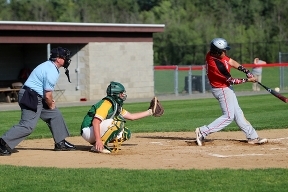 Tupper Lake (2-11) was led by two hits each from Chris Gilman and Alex Dukette. 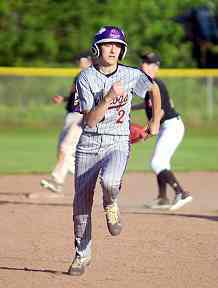 Harrisville erased a 5-0 deficit by scoring six runs in the third inning, then held off St. Regis Falls 10-7 in the Section X Class D quarterfinals. St. Regis built a 3-0 lead in the second inning on hits by Danny Lucey, Blake Mulverhill and Roger Hartson, all of whom scored. Robert Maxville and Alex White scored runs in the third to build the 5-0 Saints’ lead. But the lead evaporated in the bottom of the third when the first six Pirates reached base and all scored. The Pirates expanded the lead to 9-5 in the fifth inning, highlighted by Ryan Weaver’s RBI double and Jordan Moore’s RBI single. Regis chipped away with a pair of runs from Mulverhill and Harts on, but senior reliever Trenton Sullivan closed out the victory with just one run allowed in the final inning. The Saints closed out their season at 5-10 overall. 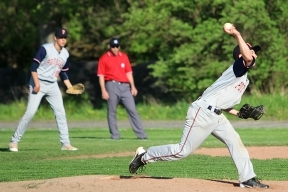 Chateaugay pitcher Jonah McDonald twirled a one-hitter in guiding the Bulldogs to a 13-0 victory over Parishville-Hopkinton in the Section X Class D quarterfinals. 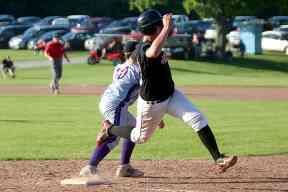 Chateaugay jumped on the Panthers with six runs in the first inning, then added four runs in third and three more in the fourth to complete the offense. 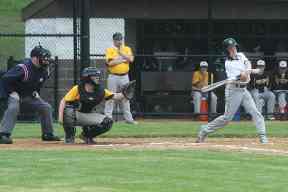 Garrett Johnston stroked three hits, while Riley Leary had two hits. Leary and Jake Reville each delivered doubles. Brendan Phippin spoiled the no-hit bid with the lone single in the third inning for the Panthers who ended their season at 1-13. Copyright © 2001-2012 ef="http://communitysights.com">CommunitySights.com. All rights reserved. All logos, photographs, text, designs and online broadcasts are copyright. No portion of this web site may be copied, transferred, duplicated or otherwise used in any form without expressed written permission.